The heart is obviously a vital organ. Proper function is essential to deliver oxygen to tissues throughout the body. When not functioning properly, our dogs and cats becoming rapidly debilitated, and indeed, can die. This week I’ve dedicated some time to explaining a type of severe heart dysfunction called congestive heart failure or CHF. I hope you find this information helpful and shareworthy. Happy reading! CHF – What is it? To fully understand congestive heart failure, one needs to have a basic understanding of normal heart anatomy and blood flow. Unoxygenated blood from the body returns to the heart via the caudal vena cava and enters the right atrium. From the right atrium, blood then flows into the right ventricle and is subsequently pumped via the pulmonary arteries to be oxygenated in the lungs. 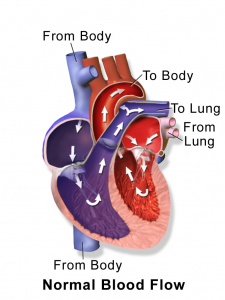 After being oxygenated, blood travels back to the heart via the pulmonary veins, enters the left atrium, then the left ventricle, and is finally pumped out of the heart into the aorta. Right-sided – This type of failure occurs when the right-side of the heart no longer effectively pumps deoxygenated from the body to the lungs to be oxygenated. When this happens, fluid accumulates in the pleural space (part of the chest cavity) and abdominal cavity. CHF – What does it look like? Regardless of whether a dog is living with left-sided or right-sided heart failure, affected pets cannot exercise normally. They become fatigued very quickly. Their resting respiratory is often more than 50 breaths per minute. 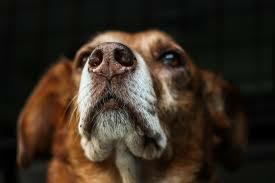 Dogs with left-sided CHF often cough, especially when lying down. Pets with right-sided failure develop distended abdomens due to fluid accumulation, and may find it difficult to rest comfortably. Non-specific clinical signs also include reduced appetite and bluish-grey discoloration of the tongue and gums. The latter is called cyanosis, and is a sign of an imminently life-threatening condition. CHF – How is it diagnosed? Dogs in congestive heart failure often need stabilization before any diagnostic testing can be safely performed. Veterinarians will review your pet’s medical history and perform a complete physical examination. Patients with left-sided failure typically have a heart murmur and abnormal lung sounds (often referred to as crackles). Conversely, patients with right-sided failure have distended abdomens with palpable fluid waves. Echocardiography is a minimally invasive sonographic examination. Any veterinarian with access to an ultrasound machine can technically perform this test. 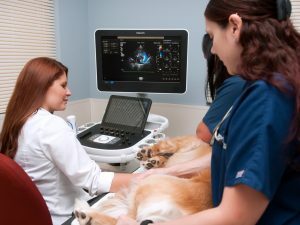 However, echocardiography is truly an art with a myriad of nuances; as such, this type of test should be performed by an experienced and trained clinician like a board-certified veterinary cardiologist. Board-certified veterinary cardiologist Dr. Karen Meltzer performs an echocardiogram on dog. Photo courtesy of Northstar Vets. CHF – How is it treated? Pet parents will likely find it invaluable to partner with a board-certified veterinary emergency/critical care specialist and/or cardiologist to develop short- and long-term treatment plans. Survival times are dependent on the underlying cause of CHF, and survival times range from days to years. Congestive heart failure is a profound manifestation of heart dysfunction due to a plethora of underlying conditions. The left and/or right sides of the heart can fail, resulting in a variety of clinical signs like coughing and exercise intolerance. Timely diagnosis and prompt intervention is essential for maximizing the likelihood of a positive outcome. To find a board-certified emergency and critical care specialist, please visit the American College of Emergency and Critical Care. Thanks for reading! I’m glad you found the information helpful.